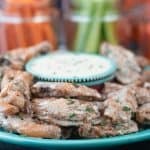 Alabama White Sauce Chicken Wings are grilled to perfection with a tangy and a little sweet dipping sauce. I could have eaten the whole plate, but I didn’t. I was nice! Haha! I just realized that we are week four into the football season and I haven’t posted any game day recipes yet! What’s wrong with me? I’m usually on it! Well, I’ll make up for it with these Alabama White Sauce Chicken Wings! Even though our Denver Broncos are sucking (bad), we still need to eat. Maybe, these wings will change their playing skills or at least give them a little luck. I’m sure you are wondering what Alabama White Sauce is. It’s basically a BBQ sauce that is popular in north Alabama. Every region has it’s favorite and this originated there. It’s delicious. It’s called a white sauce because it’s mayonnaise-based. This sauce has a definite twang, a little heat and is finished off with a tad of sweetness. It basically hits all your taste buds. Which is great in my book! The best news about white sauce. You don’t need to cook it and it’s best served on the cooler side. Alabama White Sauce is great on any grilled chicken dish or (OMG) amazing poured on top of pulled pork. Try it on smoked ribs as a terrific finishing touch and something that you wouldn’t normally do. I love white sauce. I made chicken wings this week, but as you can see it’s very versatile. It’s a 2-fer recipe. The dry rub is also terrific on chicken or pork (just omit the baking powder if using on skinless meat). You are probably wondering why I said baking powder. This is a trick that I learned a while back and surprisingly it works! When baking powder and salt are combined, the chicken skin dries out and gets crispy when baked or grilled. To get technical, the Ph balance raises. This allows the peptide bonds in the chicken skin to break down and become crispy when cooked. I know it sounds crazy but it actually works and it’s a much healthier alternative to frying (chicken wings). This method works great with the whole cut up chickens that are baked or grilled as well. As a side note, choosing the right baking powder is important. I am not being sponsored but it’s worth talking about. Some baking powders contain sodium aluminum phosphate. It’s the reason that if you cook with baking powder and use too much, your food may have a metallic taste. Yuk. I had this happen to me when I made biscuits. I couldn’t figure it out and did some research. 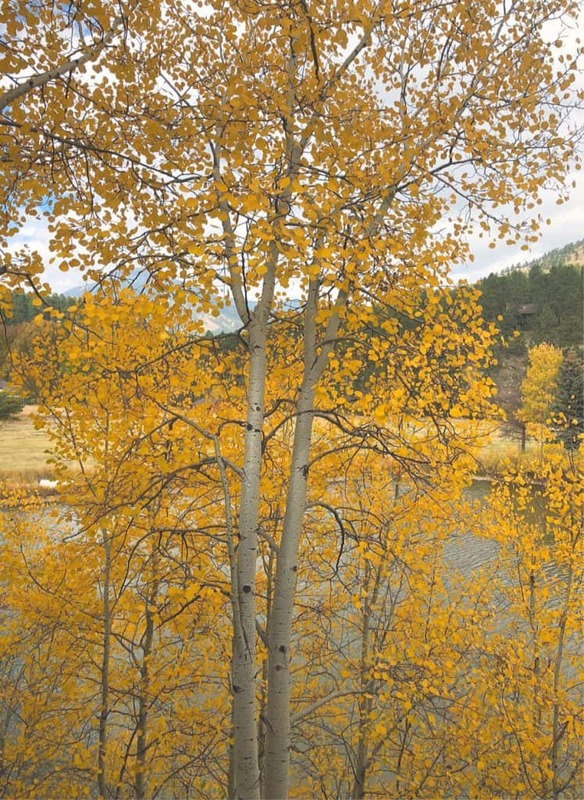 Here is a great article by Epicurious explaining it all if you want to know more. So for this recipe, I’d use Rumford (Clabber Girl). It’s an aluminum-free baking powder and better for making recipes that don’t have a ton of ingredients to cover up the metallic flavor. Let the dry rub sit on the wings for at least 4 hours up to overnight before grilling or baking. 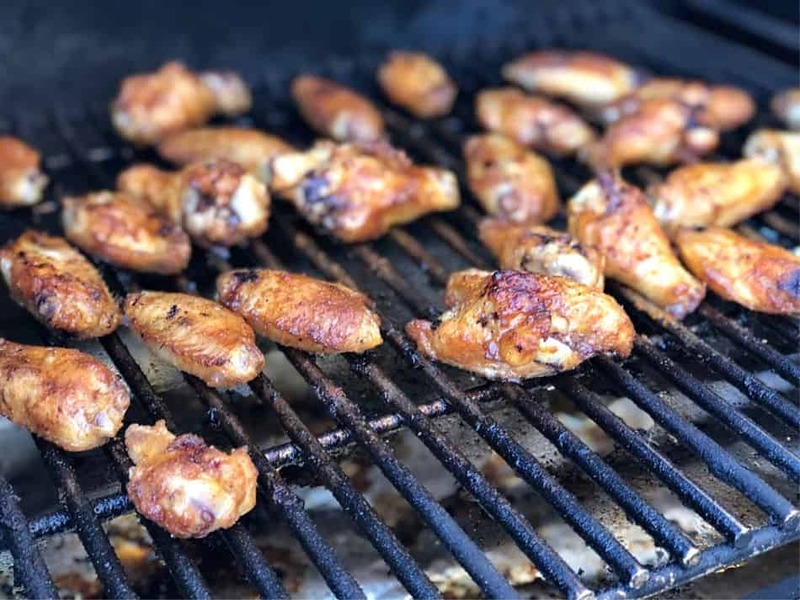 Grilling chicken wings is fast and way more healthy than frying them. I gave these a little smoke as well! 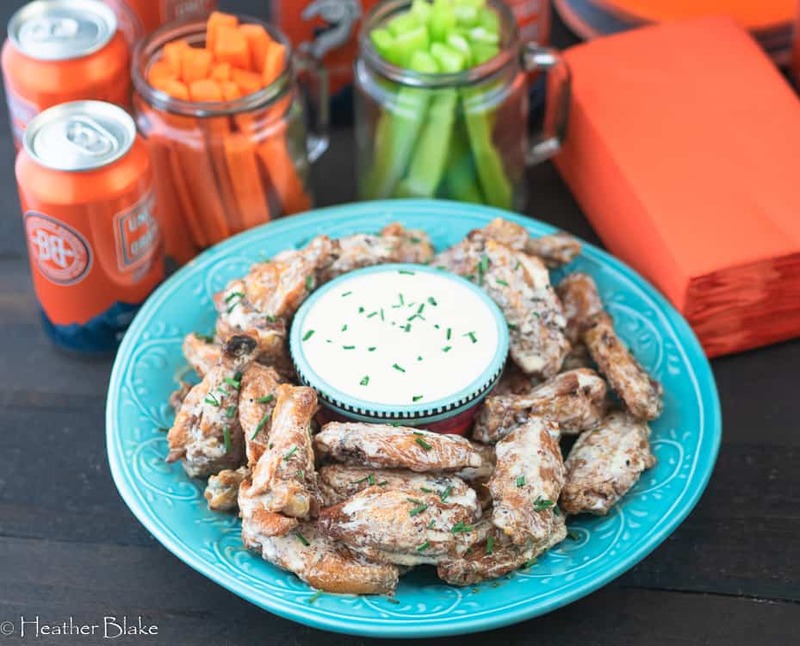 You can never have too many chicken wings for a tailgate or football watching get together! 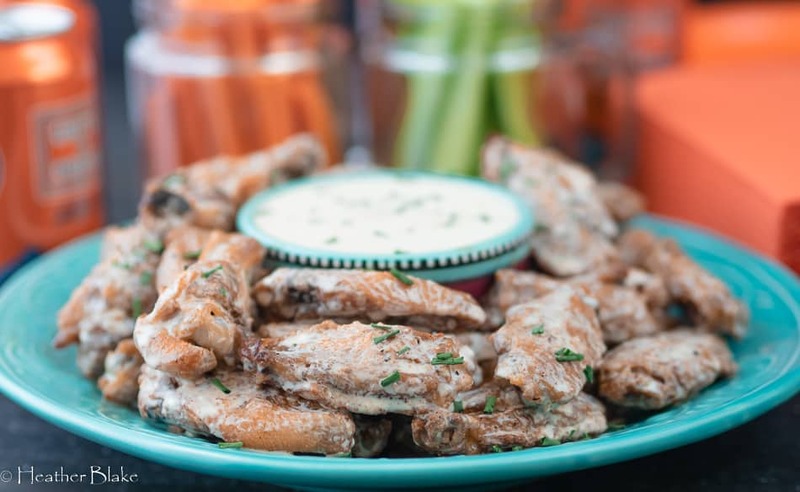 These Alabama White Sauce Chicken Wings may win the game! The aspen leaves changing up in Evergreen, CO are just brilliant right now! 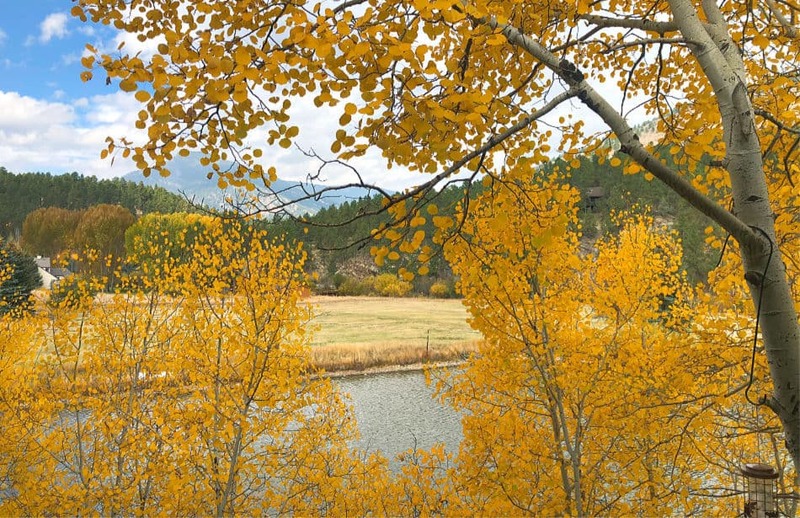 This is the view that I enjoyed looking out the window yesterday when I was watching the games on TV. I think I looked at this more than the TV! Alabama White Sauce Chicken Wings are grilled to perfection with a tangy and a little sweet heat dipping sauce. The sauce and the dry rub are terrific on chicken and pork. In a bowl combine the baking powder, brown sugar, salt, paprika, garlic, onion, chili powder, pepper, and cayenne. Set aside. In a medium-sized bowl, whisk together the mayonnaise, honey, pepper, horseradish, salt, garlic, cayenne, and mustard. Set aside. This can be made in advance and kept in the refrigerator until ready to use. Pat the chicken wings dry, place on a cookie sheet and coat with the vegetable oil. Liberally sprinkle the dry rub evenly over the wings. 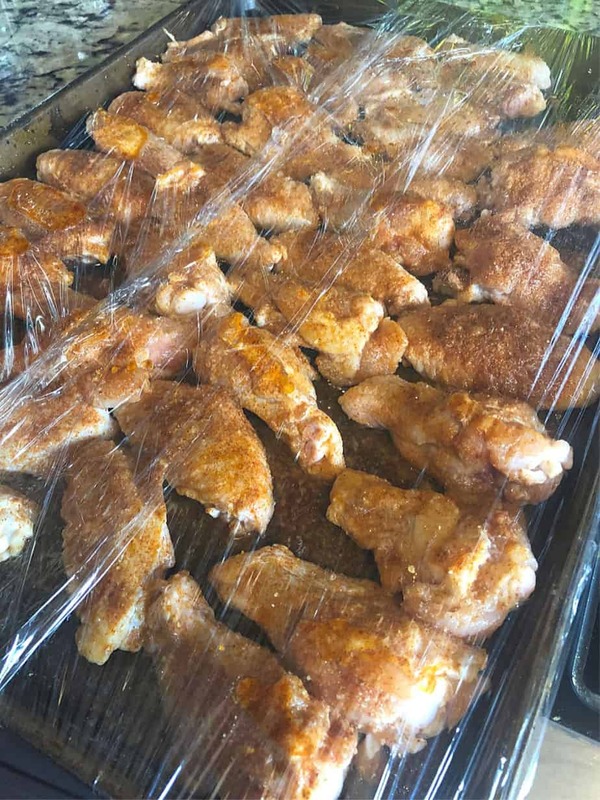 Cover with plastic wrap and let the wings sit for 4 hours up to overnight in the refrigerator. Heat up your oven to 350 degrees and bake the wings for 30-40 minutes or until the internal temperature reaches 160 degrees. You will want to turn the wings over at the halfway point. Or you can grill the wings. Same cooking directions as above. Just on the grill. Bonus round... smoke the wings at 205 degrees for 1/2 hour-45 minutes. Remove from the smoker and adjust the heat to 350 and finish cooking the wings until the internal temperature is 160 degrees. When the wings are cooked, place in a large bowl and toss with 1/4- 1/2 cup of the Alabama White Sauce. Reserve the remaining sauce for dipping. Serve warm or at room temperature. Tasty either way. Loved that these are so easy to prep in advance and cook the next day!! We had a superbowl party to attend and these were G-O-N-E before halftime!!! I got LOTS of comments on the unique flavor and a few RollTide (YUCK) comments when i told them your source was Alabama! Absolutely will be a repeated dish!! !